So you have heard of bears in Romania, but probably not in a good way. They were a popular tourist draw many years ago. One, that I admit, made me hesitant to go to Romania, even now. Unfortunately, at that time, the bears were exploited, mistreated and kept in small cages. Many suffered psychological abuse as well as physical. Thankfully, when Romania joined the EU in 2007, all dancing and caged bear practices were no longer allowed under EU law. Zoos also had much higher standards to uphold, many of which had to close. But, as all the bears suffered at the hands of humans, they would not be able to return to the wild and survive. In 1998 one Romanian woman, Cristina Lapis witnessed baby bears being used as a customer/tourist draw at a restaurant (why this would entice people, I don’t know), she then saw the same issue elsewhere in her country. In 2005 construction started on a bear sanctuary near Brașov. She fought hard to free captured and miss treated bears, and provided a home to ex-zoo bears and wolves. They even house bears that have encroached too far into town limits looking for food to feed their babies. For the bears’ safety, her cubs’ safety, and obviously the humans she meets, they move them to live in the sanctuary while the cubs grow up. Then release back into the wild, far away from humans once their hunger growth spurt is over. First off, you need to really be in Brașov. This is a day trip (combined with other things) from Brașov. This area is seriously beautiful, so it is well worth spending a few days. You could spend some time in its neighbour, Rașnov too. Brașov is larger and tends to have more accommodation offerings. The train is the easiest, fastest and cheapest way to get to Brasov from Bucharest and back. Tickets are easily purchased at the counter in Bucharest Nord train station. Purchase them at least one hour before to secure a seat. You will need to get to Auto station 2. This is where the buses depart from for their neighbouring towns. We made a mistake and went to the main train station (also a bus station) and got on a bus the ticket lady directed us too. Oops. This took us to the wrong spot! So after a hike, we got the Auto station 2. Once there, everything made sense. So go there and avoid any confusion. You can take bus 23 from the main train station to get close to Auto Station 2, but follow your GPS and know where the bus station is. The bus to Rașnov is super easy to find. It literally says Rașnov as one of the destinations in the window, numbers on buses aren’t used. There was no timetable that we could see. But, as Rașnov is on the way to many other towns, most buses seemed to go through there anyway. Get the bus to Raşnov. This is actually the closest to the Bears, not Zarnesti (the town) as the name would suggest. Track your GPS on your phone and get off on the road running parallel to the train station, if you have time, grab a snack from the Penny Market across the tracks. There is a bus stop here, and if you stand up on the bus on this road, the bus will stop. No button to press for stopping the bus. Ask around for them to take you to the Bear sanctuary. Or simply say Bears. They all know exactly where it is. We couldn’t get one to use a meter. It should be 1.79 lei per km, but we had an offer of 40 Lei (more than double the meter price) and another for 30 Lei. One didn’t want to take us at all. Apparently “the road is very bad” is used as an excuse not to use the meter. Seeing as we had no other option, we paid this. The road isn’t all that bad. Some gravel and pot holes. The driver asked if we wanted him to wait, for a fee, when we declined, he gave us his number incase we needed a pick up. The tour is an hour, so you can make that decision to pay them to wait an hour. Or see what we did instead. Time to see some bears! There are set times to see the bears, as a walking tour is mandatory. You must stick with the tour guide and follow the rules. No going up to or touching the fences, and stay quiet. We paid 40 Lei entry each as we visited in the shoulder season. See their website for up to date pricing and their schedule. You must pay extra to take photos with a proper camera, phone photos are ok. Why, you ask? We have no idea! Photo fees are common in Romania. As it says on their website and their gate, this place is not a zoo! These are bears that have been abused and hurt by humans their whole lives, so they need peace and quiet and help to live a rehabilitated life. The walk is around 30-45 minutes, depending on group size. As there were 3 tours the day we visited, the last group was rather large. It can be hard to hear the guide, as he keeps to the rule of being quiet. Keep close to him if you want to know the bears stories. They have also rescued some half breed wolves from a zoo that closed down. They are beautiful creatures who have a delicacy for eating the resident crows. After your tour, you are returned to the gate to leave. This is where you can get your taxi (who waited for you) to take you back to Rașnov, or even to Bran, to see Draculas supposed castle. Or do what we did, which was a reluctance to try hitch hike off any of the leaving guests (we aren’t hitch hikers, ever), so we walked down to the main road to try put our thumbs out for a ride back to Rașnov there. Well, after a few minutes of walking with once again a hesitance to try hitch hiking, a car pulled over. She asked us if we wanted to go to Rașnov as she was on her way there for fuel. As she looked harmless and genuine, we agreed. She then went on to tell us she was very poor and didn’t have a job at the moment, but enjoyed driving people around her area of Romania. We took this hint and gave her some money when she dropped us off. She offered to take us to Bran for 20 Lei, but we wanted to see Rașnov first then catch the bus. Worth a little walk around, or to climb the hill and see the fortress. After Rasnov, you can go back to Brasov, by bus. 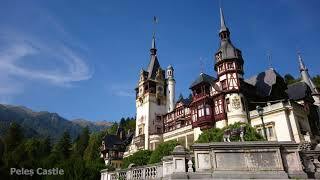 Or, seeing as you are halfway there, go to Bran castle. Aka Draculas home. From Rasnov, walk back to the street where you originally got off the bus. Turn left and walk along until you see this bus stop. (The train tracks and Penny Market are behind this) A bus to Bran will stop here. Our bus was baking hot and full of school children. Once in Bran, you can go inside the castle, once again a photo fee applies. You cannot get onto the grounds without a ticket, unlike a lot of other places. There is a rather large fence around the whole grounds. We decided not to go in, as our money was saved for another castle. Taking the drone up showed us the view we wanted to see. And anyway, this castle was used as inspiration for Bram Stokers Dracula (based off of Vlad the Impaler, who may have never even spent a night here), no vampires ever lived here…. or did they…. After Bran, its time to head back to Brasnov. Just around the corner from the main gate to Bran castle entrance is the bus stop tucked in next to a tiny food joint. Do take some time to check out Brasov. Especially just after dawn. It is beautiful. Check out our video of Transylvania!